When running a facility of any type, you are going to have a variety of different chemicals and other potentially hazardous products on site. While these are necessary for getting jobs done, they can also be very dangerous if they are spilled. Even just water can cause a hazard if it is not cleaned up properly since it can make things slippery. This is why most facilities have spill kits on hand at all times. These kits make it extremely easy to quickly clean up messes and keep the area safe. If you don’t have a spill kit in your facility, you will want to make sure to order one as soon as possible. Before you do, however, take a moment to learn about why they are so important. It won’t likely be a surprise to learn that different types of spills should be addressed using different types of spill kits. If you attempt to clean up a spill with the wrong products, it could cause a chemical reaction or it might just be ineffective. There are three main categories of spill kits on the market. Depending on what spill risks you have in your facility, you will want to choose one or more to meet your needs. Universal Spill Kits – Universal spill kits are generally made to clean up most types of spills including water and hydrocarbons. Unless it is otherwise specified on the product that was spilled, universal spill kits are likely the best option. Oil Only Spill Kits – Oil only spill kits are made to repel water and soak up oil based products such as gasoline, hydraulic oil and more. In many cases the items in these kits will actually float on top of water, absorbing the oil, which makes them great for spills in any environment. Hazmat Spill Kits – When something particularly dangerous or corrosive is spilled, you need to act fast. A universal or oil spill kit, however, can get broken down by many acids and other cleaning materials. A hazmat spill kit, however, is designed specifically with these types of hazardous chemicals in mind. Many facilities will have one or more of each of these types of spill kits so that they are ready for any situation. The kits are all going to be clearly labeled so employees and maintenance personnel can quickly grab the proper one and address the spill without delay. Sorbets – Sorbets help to absorb liquids and also serve to block a spill from spreading. Kits may include sorbet pads, pillows and socks. Safety Gear – When cleaning up a dangerous spill, the person doing the cleaning needs to be extra careful. This is why spill kits typically include gloves, eye protection, possibly respiratory protection and more. Disposal – Some kits come in a large barrel or bucket, which is where you can put contaminated items after using them to clean the spill. This will help minimize the risk of spreading the solution that was cleaned up. These containers also keep the contents of a spill kit safe while they are not in use. When ordering a spill kit, you will find that they can come in a variety of sizes. Some spill kits are for smaller areas and fit in a backpack like bag. Others are for larger areas and come in a large plastic drum, which will be used to dispose of the kit once it has bene used. If your facility only uses small containers of potentially hazardous materials, you can likely get away with a smaller kit. Of course, you always want to make sure that your kit is going to be sufficient for cleaning up the largest potential spill that may occur in your facility. Once your spill kits arrive, you will need to choose a good place to keep them. It is essential to have them in a location that is easy to access so that they can be pulled out quickly when needed. On the other hand, these kits may sit unused for months or even longer so you don’t want them in an area that they will be in the way. Once you identify the best location for the spill kits to be kept in your facility, you will want to mark off that spot so nobody puts anything around it, preventing access. Many facilities will place floor marking tape or even floor marking signs around the edge of where the spill kits are supposed to be kept. This will help remind everyone of where they can find the spill kits when they need them and also ensure they aren’t moved or blocked. If you have a large facility, it will likely make sense to have spill kits in multiple locations throughout. This will help ensure employees can easily find the kit when it is needed, and that it won’t take them very long to grab the kit and bring it back to the spill location. While it will take some planning to identify where these kits should go, it will be well worth the effort in the end. Using spill kits is not very difficult or complicated, but you will still want to provide training to your employees. Teaching them when they should use a spill kit, for example, will help ensure they react quickly and correctly in the event of a spill. Showing employees which products from within the kit will be used in which situations is another important step. 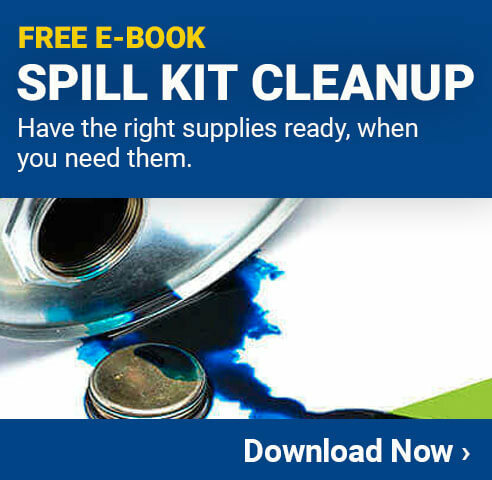 The spill kits come with some information about how to use them in a working situation, so taking that and teaching your employees will help ensure your facility gets the most out of each spill kit you keep on site. Check out Creative Safety Supply for all your spill kit needs.